Current Owner : Len Purnell, Bristol. Len Bought the bike in May 2004 following it's conversion back to 2-wheeled format and he's busy sorting the bike out and getting it into a fully road-worthy state. Colin has been a keen motorcyclist for many years. 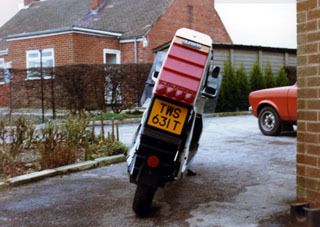 He was 51 when he first saw details of the Quasar in Motor Cycle News and arranged to visit the factory, (which he managed to trace by contacting Reliant). 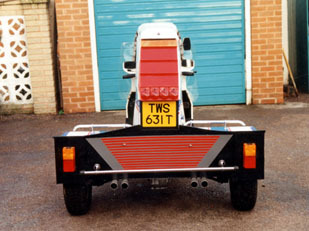 Delivery of his Quasar was delayed while it was exhibited at the Earls Court show but, on the shows close, Malcolm Newell duly arrived at Colin's farm near Chesterfield with a very battered purple factory demonstrator and the pristine new bike on a trailer. He gave Colin some riding instruction on the demonstrator in a large field and, after Malcolm demonstrated the new bikes performance at speed on a farm track, the sale was finalised. 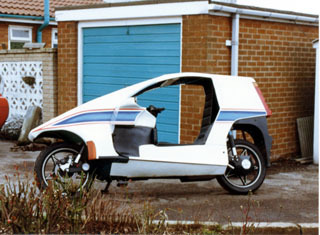 Colin covered around 30,000 miles on the Quasar and suffered no mechanical problems with it other than a leaking sump gasket. 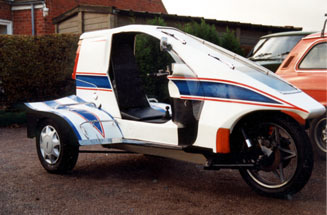 In his sixties, however, he began to find the Quasar a bit of a handful and, rather than stop riding it, arranged for it to be converted to a trike by his son. Robin Axle fitted with 13" HA Viva/Bedford van wheels. The Gearbox has been replaced with one which still had reverse fitted. The foot gearchange has been replaced by a conventional gear lever. A new seat has been made to accommodate the gear lever. The clutch is now operated by the left foot. Brake and throttle operation are unchanged. The fuel tank has been re-located into the position previously occupied by the rear wheel. The rear suspension retains the original swing-arm and shocks plus additional springs and struts. A steering damper has been fitted. The conversion was carried out with the goal of being completely reversible so that the Quasar could be returned to it's original specification. Colin covered another 10,000 miles after the conversion and continued to ride the Quasar into his seventies !